Three reasons why I hate Legos. Home » Father » Three reasons why I hate Legos. Okay, Legos are wonderful. They occupy small hands for hours. They stimulate little kids who can’t read to create new and imagination-driven creations. They come in fun colors and shapes that can be used in many different ways. So, why do I hate them? 1. They are made of plastic. I hate plastic, and the best I can say is that the kids never build a set of plates and saucers out of Legos to use to eat lunch. Still, plastic symbolizes all that is “plastic” in our culture, non bio-degradable, and fake. I say this not as an anti-deluvian octogenarian, but as a former advertising and marketing executive who has seen the error of my ways. 2. They cost way too much. Unquestionably, you are paying for the architectural minds behind the Lego creations and the elaborate directions to put together complicated futuristic weapons and warcraft. However, after the models are built and the kids pull them apart, you’re left with 99 cents worth of plastic, with every part scattered underfoot. There should be separate price if you keep the model in its finished construction or if you break it apart. Better yet, the price they charge should be for a fully constructed Lego “thing” rather than a pile of parts and a long instruction sheet. It’s your fault if you break it into a hundred pieces. 3. There should be a notice on the box that says “One dad (or two) required.” I love to make Legos with my son, but sometimes it’s just not the right time. I just don’t always have the time to get down and focus on a two hour Lego project. However, as I can attest given the fact that I bought a Lego Mars Mission set eight hours ago, there will be no Lego joy in our house until I sit on the floor and “do Legos” for a while with my five-year-old son. And, if I wait too long, he’ll open all the little plastic bags and move the parts all over the house. Ten percent of them will end up in the vacuum cleaner, turning a $35 toy into the equivalent of a 350 piece puzzle with 340 pieces. 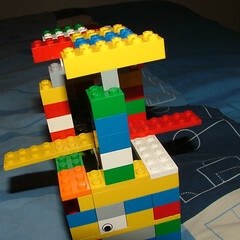 So, yes, I hate Legos, but I do love to play with Legos with my son. There is something satisfying about the click of Lego blocks fitting together. Something about the puzzle aspect that makes me feel the same way putting together a toy for ages 7-12 as I do about finishing the Thursday New York Times crossword. While my adult-sized imagination can no longer see myself in the cockpit of a Mars Mission vehicle or a Speed Racer, I do appreciate the equipment all the vehicles have. But the thing I love the most about Legos is that they are a toy my son, age 5, and I can play with together without one of us just pretending to have fun.